The five men killed were, clockwise from upper left, FBI Agent Raymond Caffrey; KCPD Det. William J. 'Red' Grooms; McAlester, Okla., Police Chief Otto 'Ot' Reed; prisoner Frank 'Jelly' Nash; and KCPD Det. Frank Hermanson. According to the FBI report, Hermanson and Grooms, standing outside the car containing Nash, took the first bullets and died instantly. They fell together where they stood. 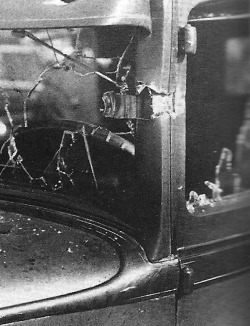 Caffrey, standing near the front of the car, then suffered a head wound, followed quickly by Reed and Nash, who were both sitting in the car. Reed was in the back, and Nash was sitting in the driver's seat. Two more agents were wounded, and a third escaped uninjured. The three who survived the deadly shooting that June morning were, clockwise from upper left, Agent Francis Joseph 'Joe' Lackey, Agent Frank Smith, the only one not wounded, and Agent Reed Vetterli, head of the Kansas City FBI Office, who was wounded in the arm. Lackey and Smith were seated in the back seat with Reed. Vetterli was standing outside the car near Grooms and Hermanson. Well OK. Here you are at the end of another exciting story. Lots of shooting, speeding cars and bloodshed. Five people dead and two wounded; a U.S. attorney declaring a "War on Crime," a President holding up the incident as an example of why the nation needed a centralized goverment, and the still relatively unknown FBI - and its power-hungry director - about to seize the moment to gain seemingly unlimited power. Within months, everyone from the three men who allegedly fired the fatal bullets, to the men who arranged the shooting, to various underworld figures, to associates of those involved, and even to the girlfriends of those involved, would be dead, in jail, hiding or under intense questioning by the FBI. The seven lawmen met as planned. After introductions (most didn't know each other before that morning) they formed a V-shaped wedge around a hancuffed Nash and briskly walked him from the train's stateroom through Union Station toward the parking lot as scores of travelers watched. Vetterli was unarmed, but Hermanson, Grooms, Smith and Caffrey were all carrying .38s, and all of them had the guns out in full view. Lackey and Reed had the only real firepower. Lackey carried a borrowed 12-gauge pump action shotgun, and Reed was holding his personal 16-gauge shotgun, a Winchester Model 97 with three features not usually found in a shotgun. First, it had an unusual safety lock. The gun would not fire if the hammer was placed in a half-cocked position. Secondly, it was constructed so that the recoil from a fired shot slid the pump's forearm grip slightly forward. When manually pulled back, it ejected the spent shell and seated a live round. The third feature allowed it to fire virtually like a machine gun. If the trigger was simply held back, the gun would automatically fire, eject, reseat a round, fire, eject, etc. Sometime during that walk through the station, one or both men may have realized they had inadventently picked up the other's shotgun. Now Lackey was holding a gun with quirky features unfamiliar to him. Once outside, the group walked quickly to Caffrey's Chevrolet and began boarding from the passenger side. Lackey got into the back seat first, sliding across until he was behind the driver's seat. Then Reed climbed in and sat on the right side. Nash started to get in, but Caffrey told him to sit in front, "Like you did coming out of Hot Springs. Then we can all keep an eye on you." Nash backed out and got into the front seat, sliding across into the the driver's seat. Smith then climbed into the back between Reed and Lackey. Lackey wedged his shotgun barrel between the driver's seat and the door. Reed pointed his barrel toward the floor, with the stock raised upward toward the roof. Vetterli stood at the passenger door facing into the car. Hermanson and Grooms stood just beyond, near the front tire. Caffrey closed the door and started to walk around the front of the car to the driver's side. Less that 100 feet away, Verne Miller and a second gunman, both carrying machine guns, observed the scene from behind the hood of a car. A third gunman was seated in a nearby getaway vehicle facing the group. All Miller and the second gunman had to do was get Nash and go. With the element of surprise and their overwhelming firepower, it's unlikely either expected to fire a shot. "Put 'em up! Up! Up!" one gunman shouted as he came around the car he was hiding behind. (Likely Miller as he was in charge of the rescue.) The second gunman moved closer to the rear of the agent's car and more into the open. Lackey, whether he heard the command or simply saw a gunman, was already reacting. Unfortunately, he still had the unfamiliar gun. As he was trying to unwedge the gun barrel from between the seat and the door, he instinctively tried to pump a shell into the chamber, not realizing there was already one there and he would have to pump the foregrip forward and reset the trigger. His actions jammed the gun. Or, the trigger may have been set in the half-cocked safety position, likely by Reed earlier, who owned the weapon and was familiar with it. It only took a few seconds for Lackey to free the barrel and raise it. Unfortunely, just as it came up, it was his bad luck to hit the proper chambering/firing sequence. The gun discharged and a load of Reed's homemade ball-bearing shot removed the back of Nash's head, killing him instantly. The shot also blew a hole in the front windshield and a ball-bearing struck Caffrey in the head as he moved across the front of the vehicle. He was pronounced dead the hospital a short time later. The discharge must have been deafening inside the small car. Lackey, who had just blown the back of the prisoner's head off, but was probably unware he also hit Caffrey, must have been in full panic. He had no idea how he managed to fire the gun - or how to fire it again. He swung the barrel toward the right front passenger window in the general direction of the approaching gunman. Unfortunely, he still had the trigger fully depressed - putting the gun in automatic mode - and the gun again fired. This shot caught Hermanson in the right side of the head. The same blast that killed Hermanson also shattered the left side window and windshield of a Plymouth parked in the adjoining space. One ball-bearing ripped the metal roof post forward, and another ball-bearing ricocheted around the inside of the car before coming to rest on the floor near the gas pedal, where it was later found by the FBI. Before Lackey's gun discharged a third time, however, the two gunmen, probably very surprised at the blast, but assuming the agents were resisting, opened fire with their machine guns. Vetterli, who had been hit in the initial blast from Lackey and had been crawling toward the front of the car, suddenly sprang to his feet and began running toward the station's doors as machine gun fire struck the granite facade around him, kicking up stone dust. The entire incident lasted about 60 seconds. One of the gunman then stepped up to the driver's side door, looked in, and said, "He is dead." Some witnesses (there were many people in the parking lot) swore the gunman reached inside the car, pulled a shotgun out, and tossed it to the ground. Though Lackey would lie about almost everything in the coming years - and even eventually make himself hero of the day - there's little doubt about his actions that morning. Harry Orr, a Yellow Cab driver who was just feet away from the agent's car, watched Lackey struggle with the shotgun, describing it much the way Lackey did in trying to get it to fire. "As they got across and some of them got in the car, I saw one man with what looked like a shotgun, and he was trying to fire it," Orr told the grand jury, in describing the seconds between the gunman saying "Up! Up!" and the first blast from inside the car. Others also spoke of at least one blast from inside the car before the outside gunmen began firing. All of this detailed information can be found in the FBI files, but little of it was included in the sanitized version released by Hoover. Lackey freely admitted in his detailed report to Hoover about the difficulty he had in getting the gun to fire, and how it suddenly went off. He all but admitted he fired first, albeit in accident. Hoover certainly couldn't publicly admit the gunmen only fired in response to Lackey discharging his weapon ... even if it was accidental. The bottom line was of the five men killed, three of them appear to have been killed by Lackey, while a fourth may also have been killed by friendly fire. Grooms was the only one clearly killed by one of the shooters. So, who were the gunmen? That's a guestion that will probably never be answered. There seems little doubt that Miller wasn't one of them. Floyd and Richetti are officially listed by the FBI as the other two, but there's still doubt. Remember the cop who claimed he shot one of the gunman in the shoulder? No signs of an old shoulder wound were found on the bodies of Miller, Floyd or Richetti. The names of William Weissman and Maurice Denning continue to surface as possibles, and that makes sense. Weissman had close and long-standing ties to Miller, and had worked with him in the past. Denning was another thug with strong ties to the Kansas City mob, which had a hand in the plan to free Nash. A lot of other names of people connected to the Kansas City mob - Jack Griffin, Al O'Brien, Jimmy "Needles" LaCapra among them - have surfaced over the years, but there was no real proof offered. The bottom line was Hoover wanted this solved, and he wanted it solved quickly. He had vague statements from questionable sources and a single questionable fingerprint, and he simply ran with it. Maybe he was right, and maybe he was wrong. No matter, the result of the massacre led to changes in federal law that empowered Hoover and his department. As a direct result, bank robbery; transporting stolen goods across a state line; interstate flight; and taking a kidnap a victim across state lines all became federal offenses. Additionally, agents were officially issued firearms, and given the power to both execute warrants and arrest suspects. Finally, what of the people directly involved? Lackey resigned after the Richetti trial, and in later years made himself the hero of June 17. Smith, his nerves shot after that day, quietly worked out his career in the Oklahoma hill country. Vetterli never regained Hoover's confidence after that day, and resigned within five years. He ran unsuccessfully for Congress and governor in his home state of Utah, and eventually served as Salt Lake City's police chief for a few years. He died in 1949 at the age of 45, while working as a radio appliance distributor. Hoover, of course, went on to a long career as head of the FBI, but his name quickly became a verb, and is still used by police to this day to describe the manipulation of the truth, as in "They Hoovered up the evidence." This is the front of the agent's car. Note the windshield glass on the hood. The window was blown out when the shotgun was discharged from inside the vehicle. The memorial marker reads: In memory of law enforcement officers killed in the Kansas City Massacre June 17, 1933. Raymond J. Caffrey, Special Agent, Federal Bureau of Investigation. 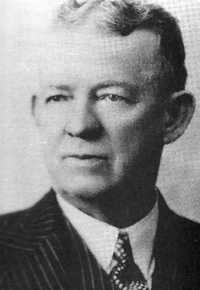 Otto Reed, Chief of Police, McAlester, Oklahoma. 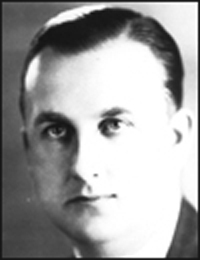 William J. Grooms, Detective, Kansas City Missouri Police Department. Frank Hermanson, Detective, Kansas City Missouri Police Department. Near this location the above named officers were slain and FBI Agents Francis J. Lackey and Reed E. Vetterli were wounded while transferring Federal prisoner Frank Nash, who had been apprehended the previous day, to the Federal Penitentiary, Leavenworth, Kansas. While in the parking lot at Union Station these officers were attacked by Charles 'Pretty Boy' Floyd, Vernon Miller and Adam Richetti, who intended to free Nash. 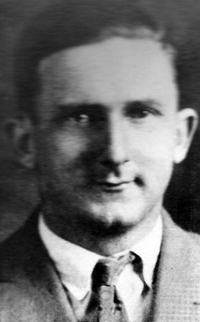 Nash was unintentionally killed in the hail of Tommygun and shotgun fire. This incident so outraged the American public that new Federal legislation was enacted the following year. Such crimes as bank robbery and extortion became Federal offenses and FBI Agents were authorized to carry firearms.Placed by the Society of Former Special Agents of the FBI. October, 1991. This is the vehicle parked next to the agent's car. Hermanson and Grooms were standing between this vehicle and the agent's car. 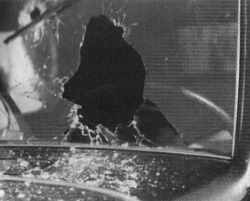 Note the driver's window is blown in, while there is windshield glass on the hood indicating a bullet passed into the driver's side window and exited the windshield. Also note the roof post is blown out as if struck at an angle from the left side of the car. The agent's car was to the left of this vehice. Above is the memorial marker placed at Union Station near the spot of the shooting. At left is a closeup of the memorial. This marker is located to the left of the entrance doors. Union Station is located at 30 W Pershing Rd.